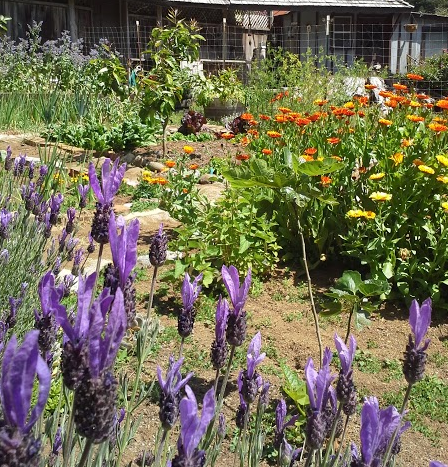 Lavender and calendula are pretty and useful additions to the garden. 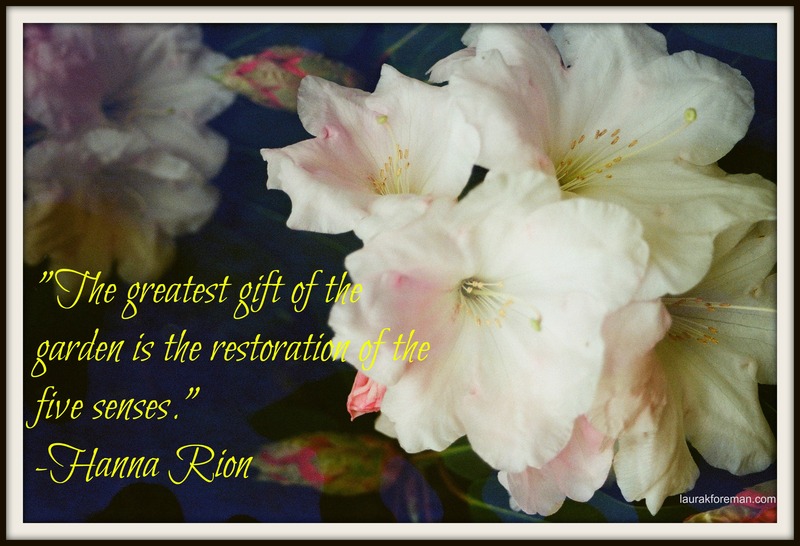 If my husband has his way, every plant in the garden would serve one clear and distinct purpose–human consumption. However, I’m not ready to dress my plants in burlap jumpsuits just yet. Flowers have a place in any garden, not just uptight English ones. Whether you plant a rose bush near your garlic patch or a peony in with your lettuce, flowers are essential to the well-rounded (and totally functional) garden. What’s better than a fragrant, pink rose? A whole bush of them! Although your garden may be teaming with vegetables at the end of the summer, it’s nothing but small plants and bare soil until then. 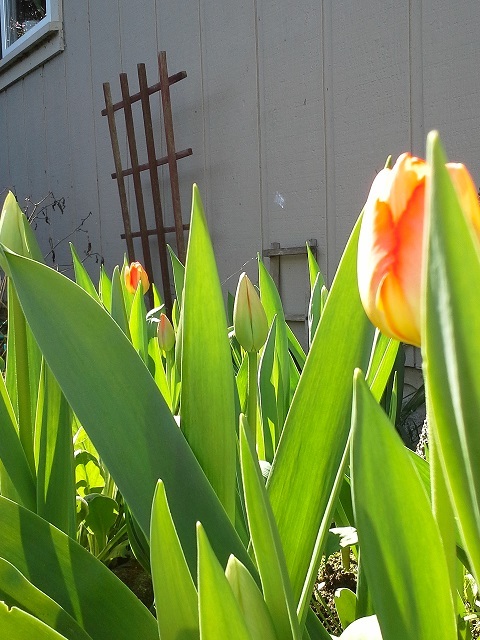 Planting flowers that bloom at different times of the year keeps your garden visually appealing to all who see it. Flowers play a vital role in maintaining bee populations. They travel from flower to flower, pollenating plants along the way. The more flowers you plant, the more likely you’ll have a banner year in produce. The bees aren’t alone; flowers are important to butterflies, ladybugs and other beneficial bugs and critters as well. They play well with your vegetables. Did you know that planting marigolds and lettuce together keeps gnarly bugs away? What about planting roses near garlic? The same scents that attract you to a particular flower also serve to keep destructive bugs away. If you’re growing organic or would like to cut down on pesticides, incorporate more flowers into your garden. Learn about Common Companion Plants in my Skillshare class (and also learn to create bitchen small space container gardens). Ready to include flowers in your garden? Hit up your local plant nursery to find flowers that are adapted to your area. There’s no sense in blowing the bank on flowers that don’t stand a chance in your bioregion. July is a great time to see the rewards of what you planted in the garden a couple of months ago. Many of the plants that take a while to grow, bloom and fruit are reaching their potential. When I was planting the seeds and starts in my garden, I remember worrying that I wasn’t planting enough. Looking at my garden now, I realize that I should have given some of my plants a wider birth (I’m looking at you, borage). Tilling is a great workout. After two months of being covered by old carpets, the soil in the garden next to my current garden has fewer weeds and was ready for a good tilling. I used a digging fork to get deep into the soil, which was much easier to break into than it was a few months ago, to unearth rich soil. It took me most of the afternoon to double-dig the 8’ by 10’ plot, pulling up rose and weed roots as I went. Then, on Monday, I planted some snap peas, sunflowers, beans, radishes, cilantro, parsley and transplanted some strawberries. 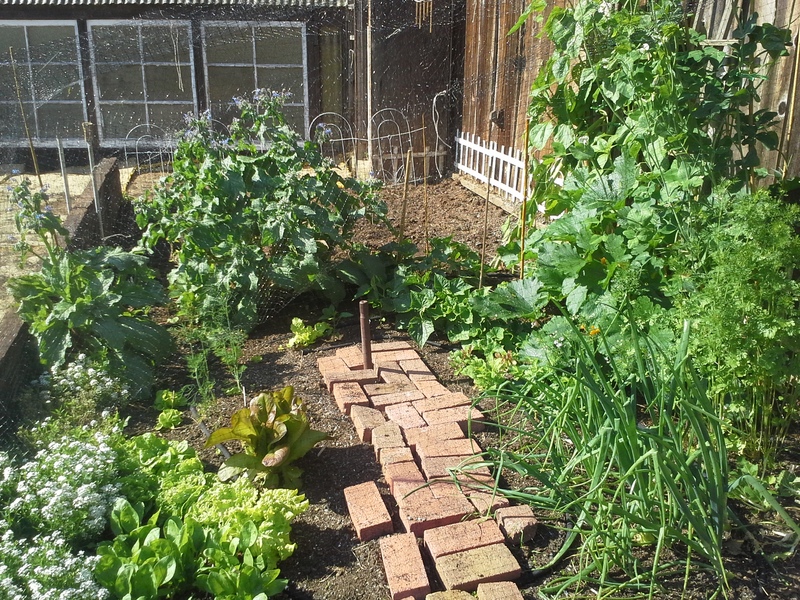 Eventually, most of the garden will become a strawberry patch, but for now I’ll grow some yummy vegetables. Forget plain ice cubes. Since my borage began to flower, I’ve been cutting the best buds and freezing them in the ice cube tray. They add some life and color to regular water and make me feel a bit fancy. Since the cilantro I planted is growing like gangbusters, I cut them back to encourage more growth and then chopped and froze the leaves of the clippings in an ice cube tray. Fresh cilantro from the garden all year round! That’s plum crazy! I finished up the plum preserves the other day. One full tree of plums has yielded 9 half pint jars of plum butter (with an assist from 5 Granny Smith apples) and 8 half pint jars of plum jam (with an assist from 3 Granny Smith apples). While the butter has a wonderful tartness with a sweet aftertaste, the jam is smooth and not too sweet. All in all the jam was easy to make. While it did involve a lot of stirring, it wasn’t as labor intensive as I feared it would be. I was worried that it wouldn’t set well—while I was ladling it into the jars, I was worried that it wasn’t thick enough. After it had time to set, it did so perfectly. It’s my new favorite jam. 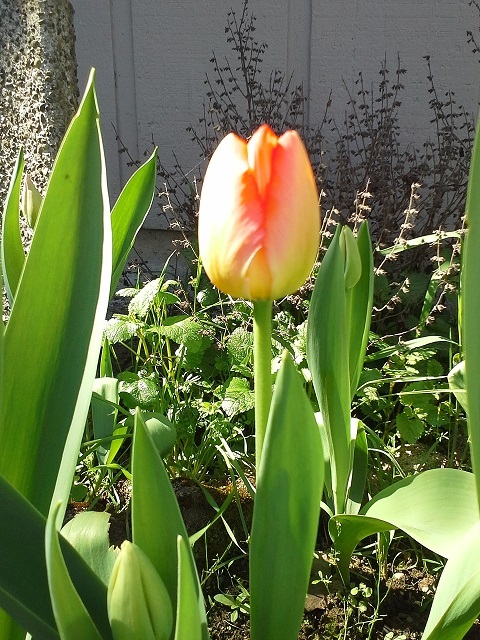 The tulips are blooming. Hooray! Happy spring! Someone got a little overzealous when planting the bulbs.